Airey Brothers Property Network is the Premier Real Estate Agency for Buying or Selling Real Estate in Massachusetts, New Hampshire, and Maine. Don't be represented by anyone else. Greenland, NH, March 01, 2019 --(PR.com)-- Airey Brothers adding to their team and Seacoast stronghold. While you are sleeping things are happening in Portsmouth and beyond. From the inner depths of your favorite restaurant to the highest heights of your local bank headquarters. iClean Facility Services, run by the Airey Brothers has over 200 seacoast accounts for commercial maintenance. Run and grown by the Airey Brothers, they have little time to sleep. Matt Airey, Seacoast High Tech Entrepreneur who brought to market the world's first bio-based ink and toner product says business is what keeps them focused. 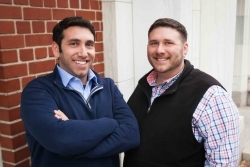 These brothers don't stop at Technology and Facilities Maintenance...They have also begun capitalizing the highly competitive space of Real Estate in Maine, NH, and Massachusetts. They have loved real estate since they were young and buying and flipping homes at a young age. Now, they have teamed up with Keller Williams Coastal Realty of Portsmouth and begun growing the ABPN brand in Massachusetts, New Hampshire, and Maine. The Brothers are long on effort and short on excuses. When asked where they find the time for these endeavors, the answer was quick, “We will rest when we’re dead...we have an opportunity to make a difference, and we are going to continue to do so,” said Matt Airey. "Keller Williams Coastal Realty in Portsmouth felt like the best place we could grow our brand." KWCR operated by Nathan Dickey has had long success in the Seacoast and is especially interested in the new buzz created by ABPN and the Airey Brothers. The Airey Brothers Property Network (ABPN) as it’s called has already grown considerably in Massachusetts, Maine, and New Hampshire in it’s short tenure. “We aren’t growing a brand with ABPN, we are really growing a family,” said Ben Airey, the Older Brother. He went on to say, "We know what we are good at, we know our competition, and the Real estate market needs a new face, feel, and flow. We think we can bring that, and we have successfully been bringing on quality team-members to reflect that leadership." ABPN at Keller Williams Coastal Realty is growing and it’s looking for both licensed and non-licensed agents in Massachusetts, New Hampshire, and Maine. “If you have a solid outlook, know how to smile, and want to make a positive impact in other people’s lives...we will pay for your school and licensing...try me,” quips Ben Airey. One thing is for sure, the Airey Brothers will not be sleeping on any opportunities and continue to grow in the Seacoast and Beyond. For more information on job opportunities with ABPN, go to the company website at www.theabpn.com or call them at 833-ABPN-NOW.